Detailed North East England surf forecast maps and the latest eyeball surf report from local surfers in the region. Near-shore swell is shown on the map together with the surf forecast rating for spots in North East England. Find the best places to surf in offshore conditions by selecting the wind option on the forecast map. 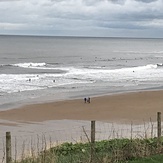 Windsurfers and kite surfers can also use this option to find more favorable cross-shore conditions in North East England. Our local Wavefinder indicates where some of the best conditions are likely to be found in North East England over the next 7 days. 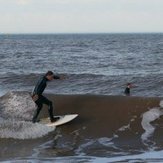 Surf photos from North East England and reviews of the best spots and surfing conditions have been provided by local surfers. All map types that you can enable here: North East England Colour Base Map, Wave Height, Wave Energy, North East England Swell 1 Energy, Swell 2 Energy, Windwave Energy, North East England Precipitation, Wind, Temperature, North East England Cloud Cover. Map overlays available for display: North East England Pressure, Wind. Symbols shown on the map: North East England Surf Breaks, Tide Forecasts, Cities, North East England Ski Resorts, Live Wave Buoys, Live Webcams, North East England Wind Now, Temperature Now, Weather Now, North East England Swell at breaks, Rating at breaks. North East England Surf Forecast map for predicting the best wave and wind conditions across the region. For surfers, the map shows the most powerful swell tracking across near-shore open water and not the peak waves experienced by boats out at sea. Move your mouse over the ocean swell symbols or the surf breaks on the coastline to see a more detailed surf forecast including wave period and wind conditions. The forecast updates every 6 hours and most live weather reports update every hour. You can animate the North East England Surf map or show live wind and wave conditions as reported from wavebuoys and local weather stations. 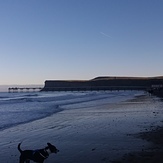 Surf breaks shown along the North East England coastline are also listed below. 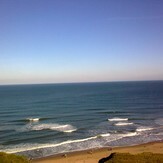 North East England is quickly becoming of the most sort after destinations in the UK to surf. With Arctic generated N ground swells storming down the coast mixed with SW and W winds creating some fierce surfing conditions when mixed with the cold north sea waters. A great road network means more and more surfers are venturing north rather than heading south to the more common and well known destinations. Most beaches also have great access with plenty of facilities locally up and down the coast. Tyneside and Middlesborough are quite heavily polluted areas where further north in Northumbria things are quite the opposite. 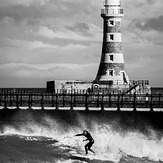 Tyne mouth is the center of surfing in Tyneside.